This is the easiest pickled banana peppers recipe. These are the best pickled banana peppers because they are crips, spicy and ready in hours instead of days. 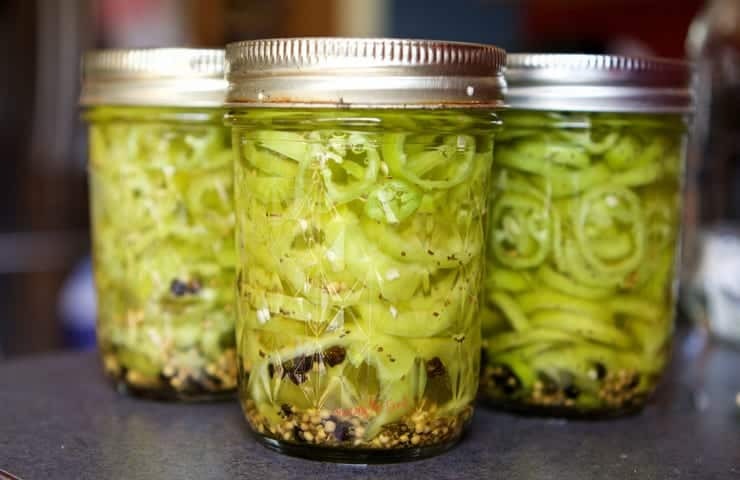 Canning crisp banana peppers has never been this quick or this delicious! I use the sous vide method of cooking to quickly pickle banana peppers. The lower temperature ensures the peppers retail their crunch while having the sweet banana peppers pickle in hours instead of days. I have water bath canning instructions for those of you who do not have a sous vide. If you are in York, Pa you NEED to head to The Left Bank Restaurant and try their flash fried calamari with banana peppers. This recipe for spicy pickled banana peppers is as close as I can get to theirs. Now to figure out the calamari part. 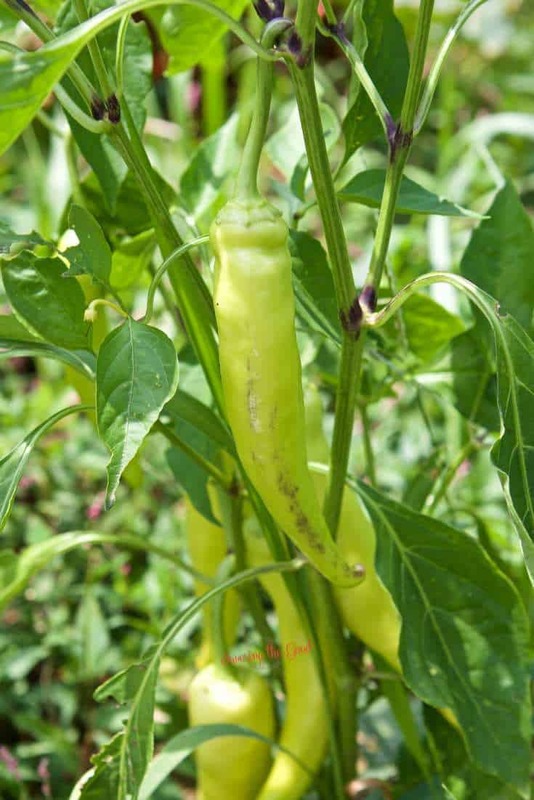 When are banana peppers ripe to pick? What is the nutritional value of sweet peppers? Do banana peppers taste like bananas? Banana peppers do not taste like bananas. They are called banana peppers because of the thin, long, yellow waxy color of a pepper that resembles a banana. A banana pepper that fell into the middle of its potential heat range would typically be about 21 times milder than a middle-range jalapeño.Like the pepperoncini pepper, banana peppers have a tang to them, but there’s a sweetness there too. It’s a hard chili not to love the flavor of, especially when pickled. Source. Why is there turmeric in pickled banana peppers? There is turmeric in this pickled banana peppers recipe to add a bit of natural yellow coloring and an unexpected layer of flavor that makes these pickled banana peppers extra special. How to prepare banana peppers for canning. Use food safe plastic gloves if you are sensitive to hot peppers. Wash banana peppers in cool water. Slice off the stem end of the banana pepper and discard the stem. To remove the seeds and membrane, insert a small, thin sharp knife in the stem end and with a twisting and scraping motion, scrape the membrane and seeds out of the banana pepper. Seeds and membranes can also be left in tact if you would like a more spicy pickled banana pepper. Using a sharp knife, slice the banana peppers into 1/4″ rings. Combine the vinegar, sugar and water and stir until the sugar dissolves. *if using a sous vide bag, combine all the ingredients in the bag making sure there is enough room for the banana peppers. Place the pickling spices in the bottom of the canning jar. Add the sliced banana pepper rings to the jar. Jiggle, shake and bang the peppers in the jar to ensure they are laying flat and taking up the least amount of space. Press the peppers down in the jar and repeat. Stop adding peppers when the peppers reach the bottom of the rings on the jar. Adding pickling brine to the banana pepper jars. Pour the brining liquid over the banana pepper rings. Use a plastic or bamboo stick to remove any air bubbles from the jar using a poking motion. Pour enough brine that the peppers are covered and there is 1/2″ head space. Clean the rim and add a new lid and a clean ring. Set up your sous vide water bath on a heat safe surface and preheat the water to 140F. Remove from water bath and place on a heat safe surface. Making sous vide pickled onions is faster than making a refrigerator pickled onions. Precision temperature in a short amount of time will produce a crisp, flavorful pickled onion. Sous vide cooking is more than just steaks. Sous vide potatoes are the perfect side dish to your favorite entree. These potatoes are infused with flavor, creamy on the inside and crisp on the outside. You may never roast a potato again! With the help of this sous vide asparagus recipe your asparagus will be tender, crisp and full of flavor. I find this is a fail proof way on how to cook asparagus. Heat canning jars in boiling water. Add pickling spices to each jar as instructed above. Pack banana peppers as instructed above. Bring water, sugar and vinegar to a boil. Remove from water and cool completely on a heat safe surface. Using a sharp knife, slice the banana peppers into 1/4" rings. Pour enough brine that the peppers are covered and there is 1/2" head space. My OH is mad keen on pickling and would love to try this. What an interesting recipe, gotta try this! One of my favorite things do do in the summer is pickle veggies and these are great! I have 3 banana pepper plants ready for action! I hope they love this recipe as much as I do! 3 plants will give you lots of peppers to pickle! 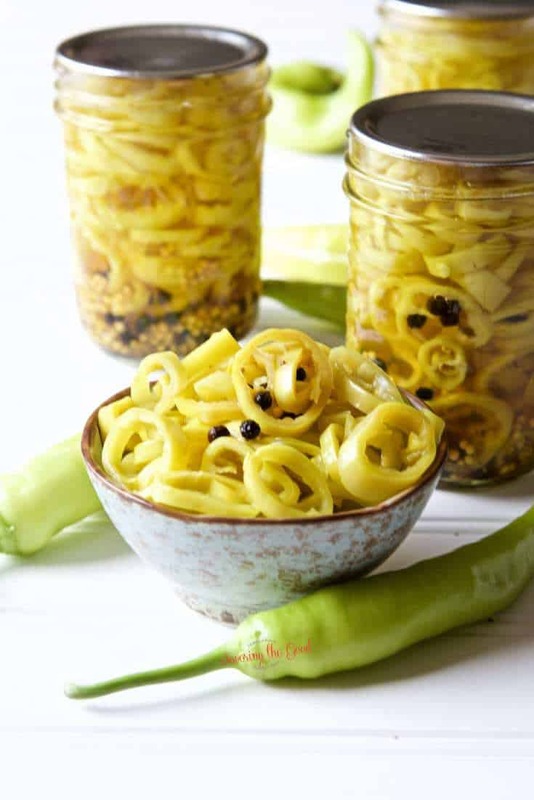 I love banana peppers and love the idea of pickling them! So yummy! We love making these all summer long! I plant them so I have a bunch to share with friends! I haven’t, although you are welcome to try adding pickle crisp. The controlled heat of the sous vide will help maintain the integrity of the peppers. Banana peppers are definitely one of my favorite foods. I’ve never pickled them before though! Thanks for sharing! You are welcome! They are amazing pickled!. Enjoy the recipe.